This concert features students from all faculties on campus sharing their talents. Come check out these great players! Grebel's Peace Society is pleased to present the 2017 Make-A-Difference Market. Get in the festive spirit with Christmas shopping, food, and music. The market supports local and fair-trade vendors in the community, while raising money for a great cause. This year we are supporting Direct Relief. Direct Relief is a humanitarian aid organization that provides health support for high-risk populations, and those impacted by emergencies. Directed by Mark Vuorinen, this 25 voice choir will perform Benjamin Britten’s quirky cantata, Rejoice in the Lamb, set to the delightfully peculiar poetry of Christopher Smart. 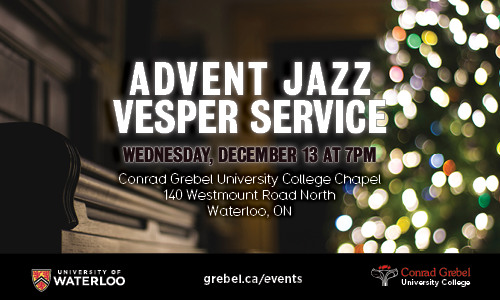 Organist Jan Overduin joins the choir in this program at Knox Presbyterian Church, Waterloo. Music by Jan Sandström, Ēriks Ešenvalds, Tim Corlis, Franz Biebl and others completes the program. Tickets are available at the door.